Teesside University graduate Zhao Jing has been recognised for her work as a documentary maker in her home country of China. 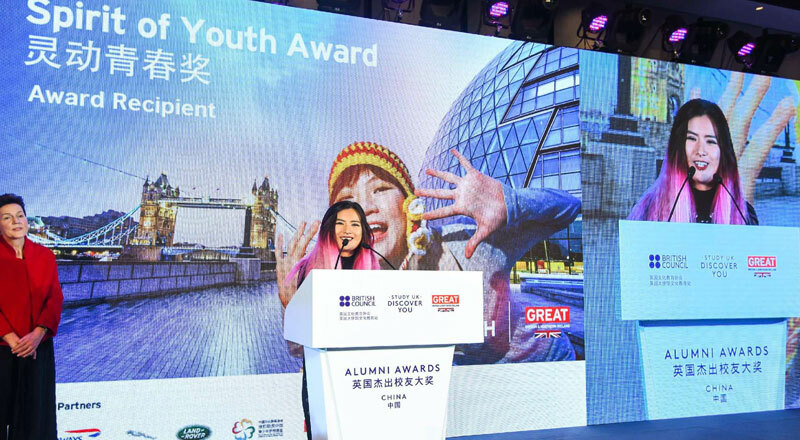 Zhao Jing, who is also known as Coco, was awarded the Spirit of Youth Award in the Study UK Alumni Awards, announced in China on 25 November. These prestigious international awards celebrate UK higher education and the achievements of UK alumni all over the world. China hosted the annual awards this year. Now in its fourth year, the awards received entries from international UK alumni from 123 countries. The awards are open to alumni who have studied in the UK, with finalists selected in three award categories; the Professional Achievement Award, the Entrepreneurial Award and the Social Impact Award. This year the Spirit of Youth award was also announced, with the aim of inspiring collaboration and exchange between the next generation of leaders in the UK and China. This award, which was won by Zhao Jing, aims to recognise contribution from a UK university alumnus in education, sport, culture and creative industries, science and innovation or health and tourism. Zhao Jing, who graduated from Teesside University with a BA (Hons) Television and Film Production in 2015, is now a TV documentary producer focusing on international co-productions. She has co-produced more than 20 programmes, which have been broadcast to audiences in more than 150 countries through channels such as the BBC, UKTV, CCTV, Discovery Channel, and National Geographic Channel. She says the placements and internship opportunities made available to her while studying in the UK at Teesside University enabled her to gain insight into the documentary production industry and build a strong network of contacts, boosting her confidence and career opportunities. She said: 'Teesside was one of my top choices because of the good teaching team and facilities for my course. They take good care of students, especially international students. Teesside was one of my top choices because of the good teaching team and facilities for my course. They take good care of students, especially international students. Her aim is to use documentary production as a tool to share China with the world and says her experiences while studying in England helped to steer her on to her chosen career path. Shortly after graduating from Teesside, Zhao Jing won national recognition in the Royal Television Society (RTS) Student Television Awards 2016. Her film, Eat then Wait for the Night, won the Undergraduate Factual award. Filmed on location in China in the setting of Chinese New Year, the film explores themes of loneliness, connections between people and the importance of family in China. Judges described the film as ‘an accomplished piece of film-making that stays with you’.